This is the first time the link has been properly confirmed. THE MOSQUITO-BORNE Zika virus causes birth defects, including a syndrome in which babies are born with unusually small heads, US health authorities confirmed yesterday after months of debate and uncertainty. “Scientists at the Centers for Disease Control and Prevention have concluded, after careful review of existing evidence, that Zika virus is a cause of microcephaly and other severe foetal brain defects,” said a statement from the federal agency. The decision was based in part on a series of studies in Brazil, where thousands of babies were born last year with birth defects, coinciding with a spike in Zika virus infections among the general public. “This study marks a turning point in the Zika outbreak,” said CDC chief Tom Frieden. There was no “smoking gun,” or single piece of evidence that offered conclusive proof, said the full report, published in the New England Journal of Medicine. Rather, the decision was made based on “increasing evidence from a number of recently published studies and a careful evaluation using established scientific criteria,” said the CDC. Further studies are being launched to “determine whether children who have microcephaly born to mothers infected by the Zika virus is the tip of the iceberg of what we could see in damaging effects on the brain and other developmental problems,” Frieden added. Zika virus was first identified in 1947 in Uganda, but the virus was poorly understood and symptoms have typically been mild, including rash, joint pain and fever. Most of those infected report no symptoms at all. Zika was first identified in Brazil in early 2015, and a surge in infants born with microcephaly began nine months later, in September. 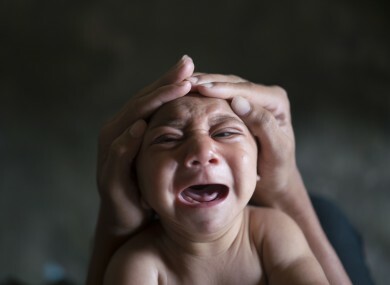 Brazil has confirmed 907 cases of microcephaly and 198 babies with the birth defect who have died since the Zika virus outbreak started, officials there said last month. The Brazilian health ministry said it is still investigating 4,293 suspicious cases. “The severe microcephaly and other brain anomalies that have been observed in many infants are consistent with an infection occurring in the first or early second trimester of pregnancy,” said the report in the New England Journal of Medicine. The confirmation comes as a separate set of researchers found that children infected with the virus suffered from severe brain damage as a result. The study, published in the BMJ, was carried out by researchers in Brazil and involved mapping out neuroimaging on children affected by the virus. It concluded that “severe cerebral damage” was found on the imaging of most children. While is now known to Zika cause microcephaly and other severe fetal brain defects, the actual risk of such birth defects remains unknown. Indeed, some women who were infected with Zika while pregnant gave birth to apparently healthy children. Email “Severe birth defects and brain damage confirmed as linked to Zika virus”. Feedback on “Severe birth defects and brain damage confirmed as linked to Zika virus”.